The Columbia River - "Oregon Pony"
Click image to enlarge "Oregon Pony", South Support, Bridge of the Gods Mural, Cascade Locks, Oregon. 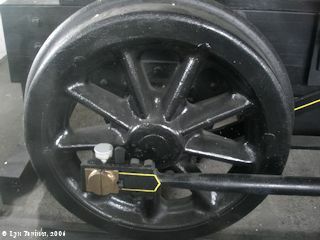 Image taken May 13, 2005. 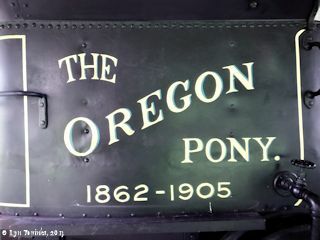 The Oregon Pony was the first steam engine in the Pacific Northwest and operated on the tramway built on the Oregon side of the Columbia River to portage around the Cascade Rapids. 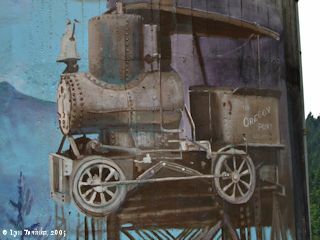 In 1862 when the Washington portage, located on the north side of the Columbia River, announced plans to upgrade to a steam railroad, Captain John C. Ainsworth decided Oregon too needed a steam engine. Ainsworth was in San Francisco and purchased from the Vulcan Foundary, rails and a small locomotive - the 13-foot-long Oregon Pony - for shipment to the Gorge. Within a few months, workers transformed the old cart-rail system of Ruckel and Olmstead into Oregon's first railroad line. On April 24, 1862, the Oregon Pony, so named because it replaced the mules who had been hauling freight, began operation. The five-mile route went from Tanner Creek to the head of the Cascade Rapids, today the location of the Cascade Locks. "... Passengers and freight would travel the lower Columbia River to the Cascades on the Fashion, Carrie Ladd, Mountain Buck, or Julia. There they would put ashore and ride the portage railroad behind a tiny rail car, affectionately known as the Oregon Pony to the upper landing, where they would board the Idaho, Hassalo, or Wasco to The Dalles. There they would ride a horse drawn wagon for a short ride around Celilo Falls then board the Colonel Wright, Nez Perce Chief, Yakima, or Spray for a cruise to Lewiston on the Snake River. ..."
In 1863 the Pony operated on the Celilo portage at The Dalles, and three years later it was sent to San Francisco where it was used for leveling sand hills. 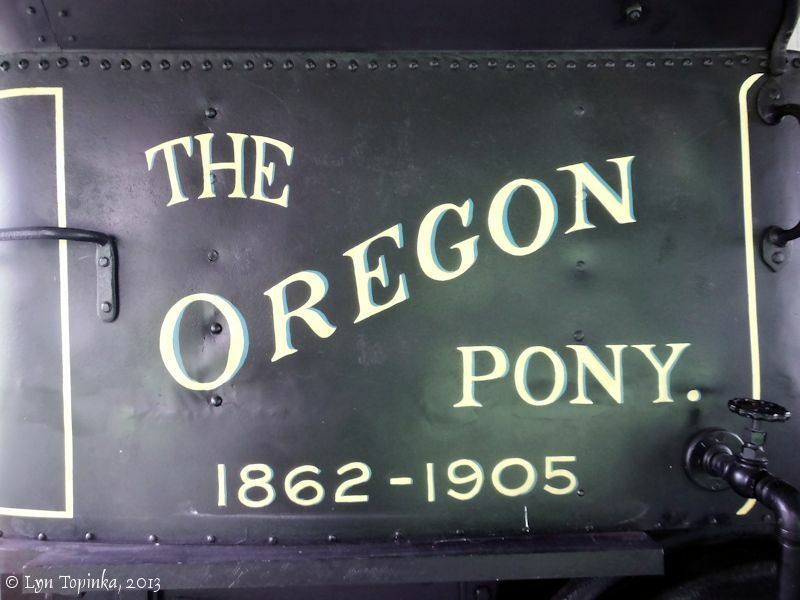 In 1905 the Oregon Pony was restored (at a cost of $2,000) and became an Oregon icon. It was on display at the 1905 Lewis and Clark Centennial Exposition held in Portland. 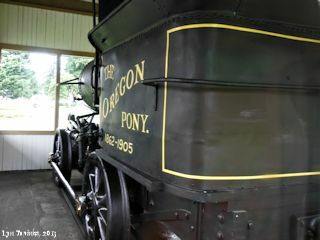 The "Oregon Pony" was on exhibit in the Transportation, Electricity, and Machinery Building. In the 1940s the Oregon Pony was on display at the Union Station in Portland, Oregon (see "The Golden Age of Postcards" below). In 1970 the engine returned to the Cascade Locks where it is now on display. It is on loan from the Oregon Historical Society and housed in a glass enclosure at Marine Park, Cascade Locks, Oregon. 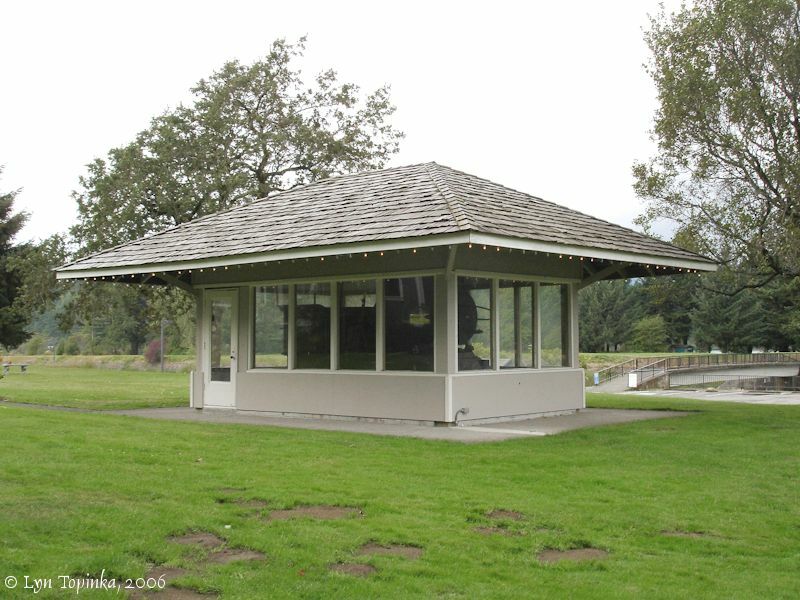 There is an information sign is out front and the Cascade Locks Museum is nearby. A mile west a painting of the Oregon Pony is included in the mural on the south support of the Bridge of the Gods. Glass enclosure, "Oregon Pony", at Cascade Locks Marine Park, Cascade Locks, Oregon. Image taken September 16, 2006. "Oregon Pony" inside glass enclosure, at Cascade Locks Marine Park, Oregon. Image taken May 19, 2013. Click image to enlarge Name, "Oregon Pony", at Cascade Locks Marine Park, Oregon. Image taken May 19, 2013. Click image to enlarge Engine, "Oregon Pony", at Cascade Locks Marine Park, Cascade Locks, Oregon. Image taken June 29, 2005. Click image to enlarge Wheel, "Oregon Pony", at Cascade Locks Marine Park, Cascade Locks, Oregon. 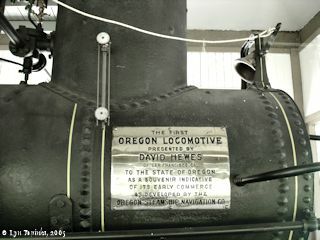 Image taken September 16, 2006.
railroad ever built in the state of Oregon." "Early travel on the Oregon Trail was extremely dangerous. The last 100 miles of the journey westward from The Dalles to the Willamette Valley included a difficult raft trip on the Columbia River. Treacherous rapids, shifting sandbars and shear basalt cliffs ended the journey for many pioneers when they approached the Cascades, known today as Cascade Locks. Early passage at the Cascades was provided by a short portage railroad. Mule-drawn portage cars hauled freight up the steep incline that bypassed the treacherous rapids. When the Washington portage, located on the north side of the Columbia River; announced plans to upgrade to a steam railroad, the Oregon portage ordered a steam locomotive from the Vulcan Foundary in San Francisco. On April 25, 1862, the "Oregon Pony," the first steam engine in the Northwest, began operation. This locomotive was nicknamed the "Pony" because it replaced the mules that pulled the old portage cars. 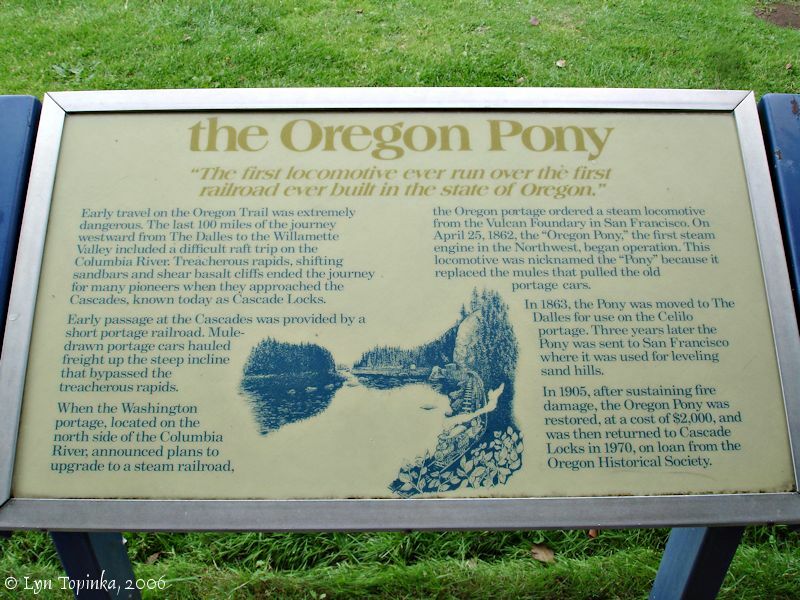 In 1863, the Pony was moved to The Dalles for use on the Celilo portage. Three years later the Pony was sent to San Francisco where it was used for leveling sand hills. 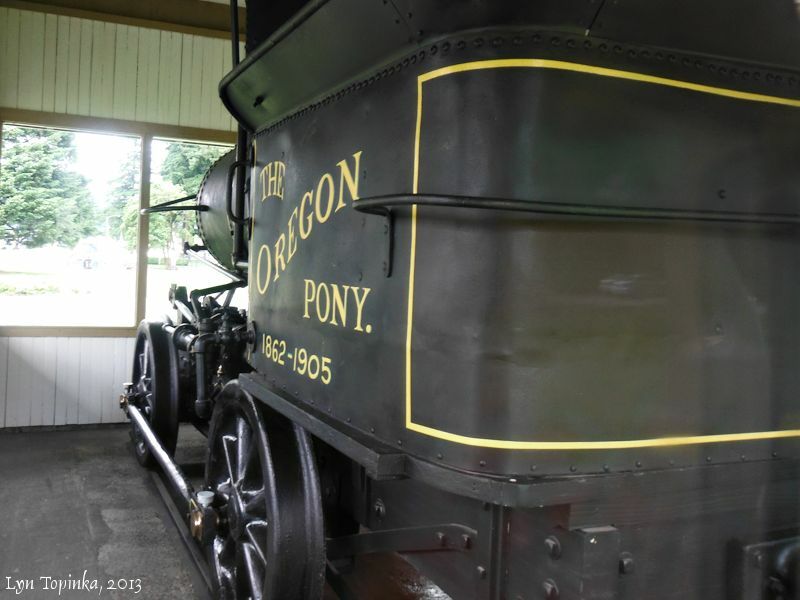 In 1905, after sustaining fire damage, the Oregon Pony was restored, at a cost of $2,000, and was then returned to Cascade Locks in 1970, on loan from the Oregon Historical Society." Source: Information sign, Cascade Locks Marine Park, Cascade Locks, Oregon, visited 2006. Click image to enlarge Information sign, the "Oregon Pony" at work, Cascade Locks Marine Park, Cascade Locks, Oregon. Image taken September 16, 2006. Click image to enlarge Penny Postcard: Oregon Pony, ca.1940. Penny Postcard, ca.1940, "The Oregon Pony". Published by Anderson Sundry Co., Portland, Oregon. In the private collection of Lyn Topinka. Caption on the back reads: "The Oregon Pony. The first steam engine to run on the Oregon Portage Railroad. Operated in 1862 and 1863, in freight and passenger service, on the southern bank of the Columbia River, between Bonneville and Cascade Locks. Now, stands in front of railroad depot, in Portland." Click image to enlarge Penny Postcard: Oregon Pony, Union Station, Portland, Oregon, ca.1940. Penny Postcard, ca.1940, "Exhibit Union Station, Portland, Oregon.". Photo by Eddy. In the private collection of Lyn Topinka. Bronze plaque reads: "The Oregon Pony. First Locomotive in the Pacific Northwest. This engline was operated in 1862 and 1863 in freight and passenger service on the first Oregon railroad, on the southern bank of the Columbia River between Bonneville and Cascade Locks."